SYNOPSIS: Acclaimed filmmaker Christopher Nolan directs an international cast in this sci-fi actioner that travels around the globe and into the world of dreams. Dom Cobb (Leonardo DiCaprio) is the best there is at extraction: stealing valuable secrets inside the subconscious during the mind’s vulnerable dream state. His skill has made him a coveted player in industrial espionage but also has made him a fugitive and cost him dearly. Now he may get a second chance if he can do the impossible: inception, planting an idea rather than stealing one. If they succeed, Cobb and his team could pull off the perfect crime. But no planning or expertise can prepare them for a dangerous enemy that seems to predict their every move. An enemy only Cobb could have seen coming. FILM REVIEW: Cobb: Dreams feel real while we're in them. It's only when we wake up that we realize something was actually strange. That is pretty much how you will feel about this movie. While you are watching, it will feel real enough but when you leave you might be like “What? What was that?” I think it’s time to come up with a new concept and I will call it the Matrix effect. The Matrix effect is that sensation you get when watching a movie and you think to yourself “Wow, this is unlike anything I’ve ever seen on the big screen.” In recent cinematic history, The Matrix was the first big production to give me that sensation. Avatar did the same, of course. And just like that, BAM!, here’s another one. There is a certain collection of directors/movie makers that you know don’t mess around when doing a job. You can be assured that they will give you good stuff every time. To name a few, you can start with Steven Spielberg and George Lucas, followed by James Cameron, Scorsese, the Scotts, J.J. Abrams, and, you guessed it, Christopher Nolan. I know there’s more but these are the ones that came to mind at the spur of the moment, and can you believe I put all those guys in the same context . . . I can be bold sometimes. Christopher Nolan is proving to be a top notch movie maker whose default is quality work. The Dark Knight may be considered his masterpiece but this one comes close. This film is dramatic, intelligent, complex, imaginative, amazing, and deep, both literally and figuratively. The special effects are incredible and appropriate for the subject matter. The cinematography and various filming locations give the special effects some good competition. It is hard to tell which is better, but they do go hand in hand very well. The story is unique and the plot is captivating and thrilling. The dialogue is intellectual and keeps pace with the complexity of the story. Dreams, mind games . . . you will be asking yourself is it real or not? Are we in a dream or is this the real world? In some ways this movie is like a new Matrix (another bold statement). But it is totally different too. The sci-fi aspect of the movie is not that overwhelming so even if you are not a fan of sci-fi, you could still enjoy this film. The characters in this movie are not given much depth or background, with the exception of the lead character, Cobb (Leonardo DiCaprio), but that really doesn’t seem to matter or affect the quality of the movie. The focus is on Cobb more than anybody else anyway. Whatever discrepancies exist are more than made up for by the performances of the cast, and what a cast. Leo of course, sharp as always although not necessarily one of his better performances. Joseph Gordon-Levitt was effective and had some pretty interesting scenes himself. He had quite a bit of hands on action too. Like Leo, Ellen Page was also sharp as always but also not one of her better performances. Marion Cotillard blew me away. She was stunning and unsettling playing the role of Mal, easily the most unstable character in the crew. This is one of those kind of movies that you will probably need to see more than once in order to make sense of it all. So stay alert when you go see it because it can easily confuse you. I can tell you that my daughter was mesmerized by it. She really loved the movie, and so did I.
BLU-RAY: The film is presented in 1080P widescreen in a 2.40:1 aspect ration preserving its theatrical format. The picture is just flawless, giving the film and special effects clarity that only high definition can provide. Not only the picture looks excellent in this release, also the sound it is good, a 5.1 DTS-HD Master Audio (48kHz/24bit) that provides a good complement to the picture. It also includes English, Spanish and Francais subtitles. The Blu-ray is loaded with featurettes taking viewers to the extraordinary world behind-the-scenes of the making of the film. It also includes an interesting featurette called "Dreams: Cinema of the Subconscious" in which a leading scientists talk about the possibility of parallel reality. Finally it also includes a DVD and Digital copies. 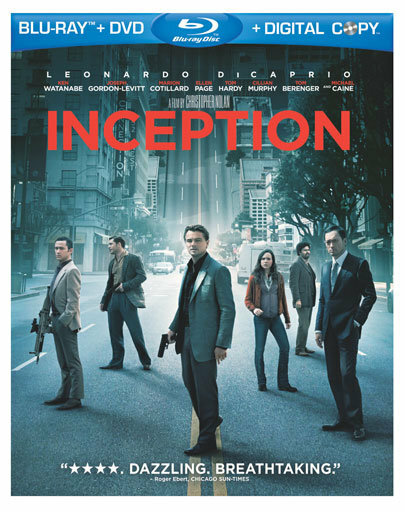 On December 7th, INCEPTION will also be available ON DEMAND through Digital Cable, Satellite TV, Xbox 360 and PlayStation 3 game consoles and it can be downloaded for rental or purchase on iTunes and Amazon Video On Demand. 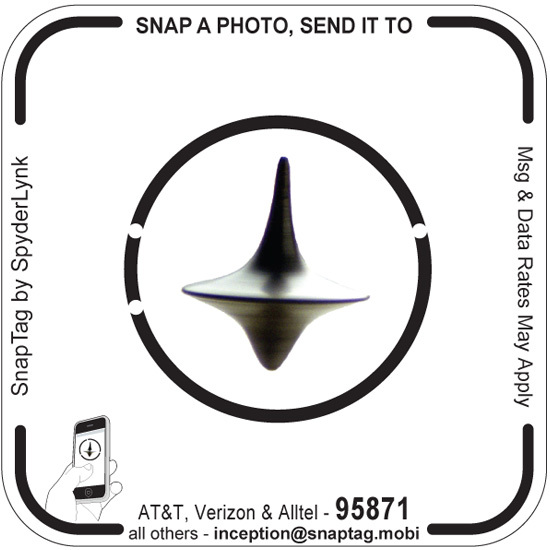 Finally the Blu-ray Combo includes the last Inception Snap-A-Tag to Unlock the Dream! DiCaprio and the rest of the cast and crew designed and achieve the movie's signature moments. Dreams: Cinema of the Subconscious Documentary: Can the dreams world be a fully functional parallel reality? Joseph Gordon-Levitt and leading scientists take you to the cutting edge of dream research. Inception: The Cobol Job Digital Motion Comic: See the events that led to the beginning of the movie.